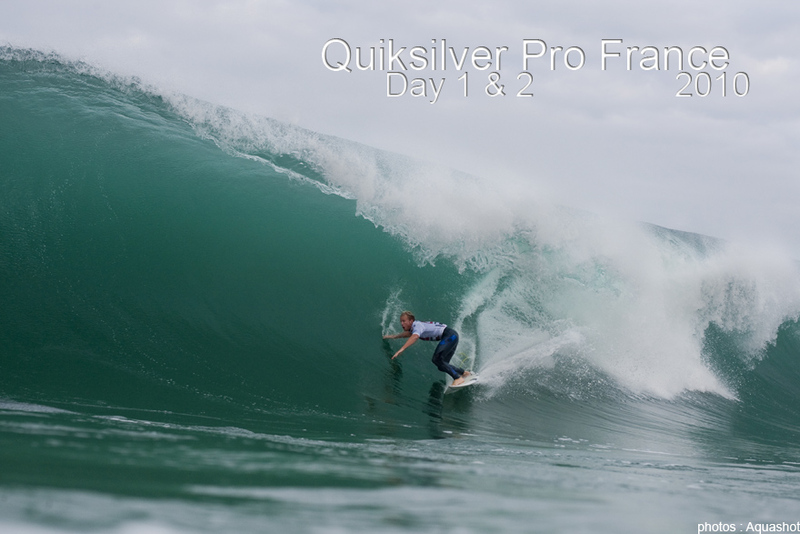 Have a look on the pictures of the first two days of the Quiksilver Pro France 2010 in Hossegor, France. All pictures available on Aquashot.fr. Watch the event on the official website on Quiksilverlive.com. Surfers of Roxy Team : Kassia Meador, Jennifer Smith and Candice O’Doneill were in france during July 2010. Have a look on a session at hossegor, Culs Nus beach after Roxy Jam 2010. On 11 and 12 September, 49 young surfers took part in the Red Bull Hitch n’Surf on the South West coast of France. Aged between 12 and 20 years old, the teenagers were invited to either Lacanau in Gironde or Anglet in the Basque country to spend the day training and perfecting their skills with the tips of pro-surfer Tim Boal and coach Richard Marsh. A full-on athletic program including warm-ups, a practice session and a contest awaited the participants who gave their best to climb onto the top step of the podium. Who said there were no lessons at week-ends?! As usual, the kids waited to be picked up at the bus-stop… But this time, with a surf-board under their arm. Jumping on the double-decker London bus, the beach blonde girls and boys knew they were in for a day unlike the others! Waiting for them to climb onboard were two sportsmen specially chosen for a jam-packed day of technical training: Tim Boal, member of the Dream Tour 2009, and Richard Marsh, sports coach and ex-member of the top 8 surfers world-wide. The aim of the day was for the teenagers to find just how challenging it can be preparing to be a professional surfer! With all the riders onboard, the bus took off in direction of the current best spot on the coast. The day started off with intense warm-ups with Richard and a few hours practice out in the surf with Tim. In the afternoon they watched commented videos of themselves surfing that morning and then competed in a friendly contest. In Lacanau, on 11 September, weather conditions weren’t great to begin with, the tide was low, the wind off-shore and shorebreak over 1,20m. The amateurs were having difficulties shortboarding but after lunch, things went more smoothly and the weather eased up. The waves were longer and the kids were able to give it their best to impress Tim Boal. The day after, in Anglet, ideal conditions enabled the participants to show their best surfing style all day long! “It was so cool, the conditions were great and it was really special surfing with Tim Boal! I’m really pleased I came!” the winner in Lacanau, Vincent Feillon, said. Vincent, only 13, is already known in the region for his good results and beat his older brother by half a point. Pierre-Valentin Laborde, who took first place in Anglet on the day after, stated: “It was a very nice day and a great opportunity to train with Richard, who is a great coach. He gives very good tips and focuses on the technical aspects, whereas my trainer usually gives more attention to the tactic. We gave our best today and have now even more motivation.” “It really was a great week-end” added Tim, “there was a nice feel and a little competition in the air too. It’s cool for kids from different areas to meet up like this, I would have loved to have a chance to do that when I was younger”.